When it comes to the band saw, it is the single most versatile cutting tool which you can have in your workshop. Incorporating a couple of wheels in its usual design, you can use this product to cut through plastic, wood, and metal along with various other materials. This saw can make curves in delicate materials and it can also cut down thick lumber into manageable pieces. 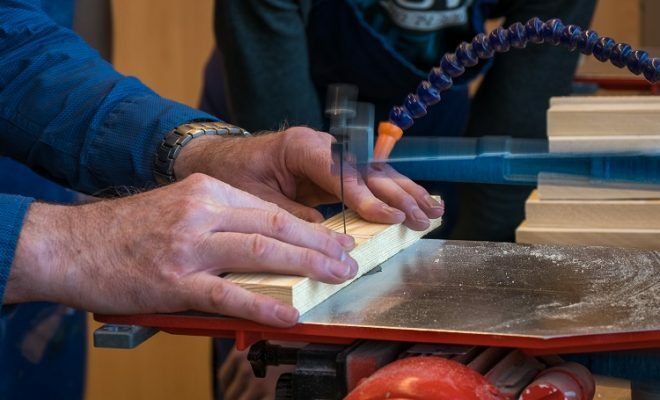 You can also use this power tool to cut one material into a number of different shapes and when it comes with a vibration-free working, it makes it an ideal cutting tool for a wide range of woodworkers. 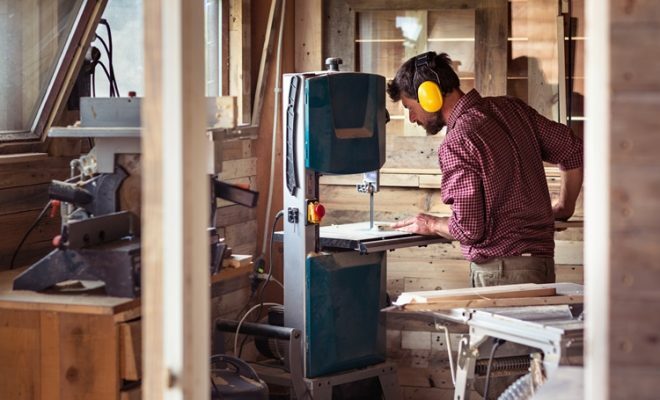 So if you’re looking for the best band saw 2019, one which can be used for an extended duration of time, you’ve just landed at the perfect place. The below-mentioned guide incorporates top 7 comprehensive band saw reviews which you can purchase from today’s market. The WEN 3962 is designed for all those woodworkers who’re involved in some serious cutting stuff. This product makes use of a 3.5 AMP motor along with a 9 ¾ inches throat which allows you to handle a wide range of materials. You can operate this saw at two different speeds and for your convenience, the manufacturer is offering a 2-year warranty on this purchase. The WEN 3962 comes with a 25-inch work table which allows you to make bevel cuts from 0-45 degrees. The overall weight of this saw is just over 70lbs which ensures that you’ll always enjoy a solid, still, base regardless of the intensity of the work. Such kind of construction eventually results in better accuracy which is ideal for both, professional as well as hobbyist DIY users. In addition, it makes it quite a portable band saw which can be easily transported from one place to the other. 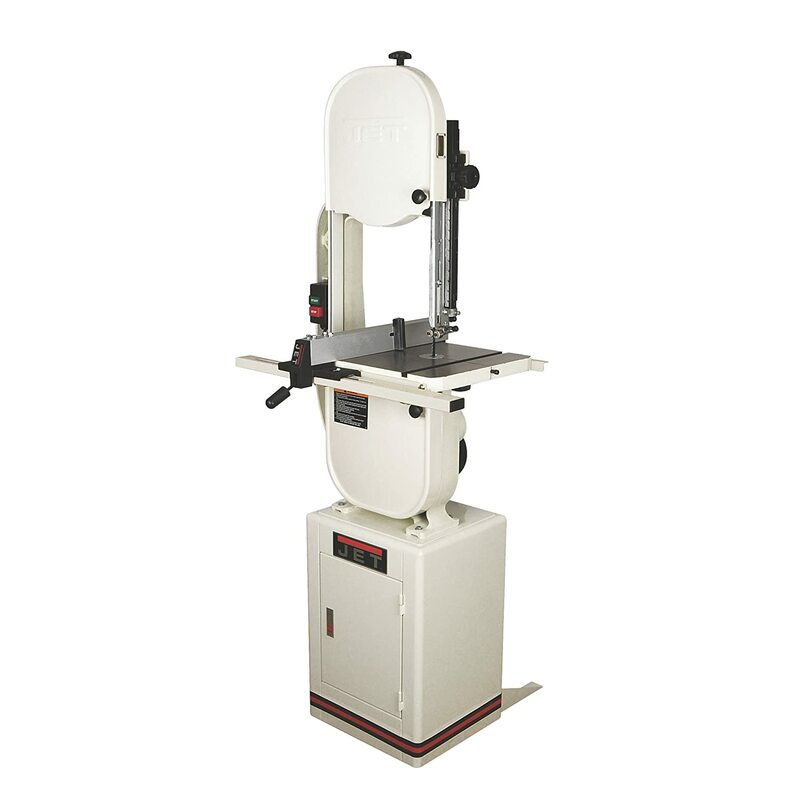 As already mentioned, the WEN 3962 is a dual speed band saw which can be operated at two different speeds. Depending on your cutting job, you can operate this saw at 1520 blade speed FPM for cutting through delicate materials. However, if you’re looking to cut through relatively thicker materials, you can always go with the 2620 feet/minute blade speed. You’ll get a handful of accessories on purchasing the WEN 3962. First of all, the manufacturer is offering a flexible work light which ensures added visibility. Then comes the 3-in-1 dust port which comes handy for all those of you who want to keep their job site free from any kind of dirt and debris. Also included in this purchase is a miter gauge. And finally, you’ll get an aluminum-made fence. The WEN 3962 is designed for all those woodworkers who’re involved in small to medium-sized cutting applications. This product features a better cutting capacity as compared to other 10-inch saws and when it also comes packed with a series of additional accessories, it gives you a good value for your money. If you’re looking for a versatile band saw, one which can cut through wood, plastic and even metal with a similar ease, have a look at the JET JWBS-14DXPRO. Incorporating a sturdy cast-iron frame, this saw comes with a 13.5-inch cutting capacity across the width and a 12-inch cut capacity across the height of materials. It also features a 12-inch resaw capacity and for added safety, this product is designed with a retractable blade guard. The JET JWBS-14DXPRO is powered by a 1.25HP motor which is more than capable of handling the toughest of materials in your workshop. As compared to other 14-inch band saws in which the motor is usually designed at the bottom cabinet, this product incorporates motor in its lower saw housing. Such kind of construction results in added storage space which comes handy for storing a large number of valuable accessories. In addition, it also makes it easy to adjust the tensioning as well as replacement of the blade as all you’ve to deal with, is just the tension release handle. For changing the blade, you just have to push the handle up to release tension. After replacing old blades with a newer one, pull the handle down until it gets locked down in place. The JET JWBS-14DXPRO comes with a couple of high-quality wheels which are made of cast iron. The wheels are designed in such a way that regardless of the thickness of your material, they tend to produce a very little amount of vibration. Inside these wheels are the durable polyurethane tires which can be used for an extended duration of time. The tires come in a sharp yellow color which makes it easy for you to track the blade. The JET JWBS-14DXPRO comes with a spacious work table which is also made of cast iron. This table is big enough to support large sized materials and it comes integrated with a miter slot. Depending on your preference, you can tilt this table to 45 degrees on the right side and 10 degrees to the left. This table is at a height of 43.5-inches from the surface which makes it easy to access. The JET JWBS-14DXPRO is one of the best band saws 2019 which you can purchase from today’s market. Weighing in at 258lbs, this product provides enough power to cut through a wide range of materials. 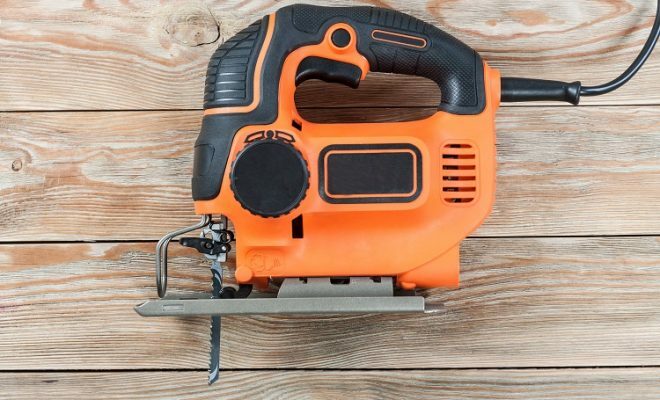 It possesses a better re-sawing capacity as compared to other 14-inch band saws and when it also comes with a heavy-duty cast-iron frame, you can use this saw for years to come. Incorporating a 1HP motor, the Grizzly G0561 is a horizontal band saw designed to cut through metal. This model incorporates a compact design which makes it quite a portable cutting tool. It also comes with a wide range of superb features, including automatic shut off and a hydraulic feed control, so you can rely on it without any second thought. Apart from cutting metal with this particular tool, you can also use it on a wide range of other materials with as long as their thickness is no more than 7-inches. For optimal safety, the manufacturer has designed the Grizzly G0561 with a flawless automatic shutoff feature. This particular feature works in such a way that once the top arm has completed the cut through metal or any other material, it will automatically switch off this band saw. Yet another high-quality feature in this band saw, the Grizzly G0561 makes use of a superior coolant system for enhancing the lifespan of your blades. Basically, this machine comes with a coolant tank which can hold in 2.5 gallons of fluid at one time. Depending on your preference, you can adjust the amount of fluid, which is going to flow out of the tank, with the help of a separate hose. Apart from increasing the lifespan of the blades, it also results in ensuring precise cuts on a consistent basis. However, one thing which you have to keep in mind that you have to purchase the coolant fluid on your own as it doesn’t come included in this purchase. The Grizzly G0561 is made of heavy-duty cast iron as the manufacturer has used this particular material while crafting the saw bed, frame and even the wheels of this best horizontal band saw. 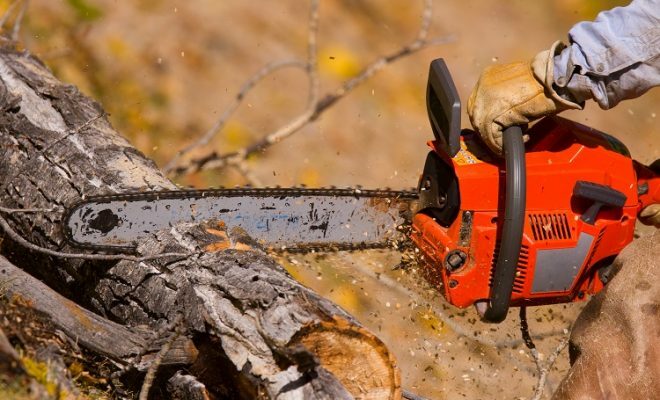 Even though it makes it a heavyweight product, as the overall weight of this product is just above 300lbs, it does make sure that this saw won’t wobble around regardless of the intensity of the usage. If you’re looking to purchase the best horizontal band saw for metal cutting, there aren’t much better products than the Grizzly G0561 in today’s market. 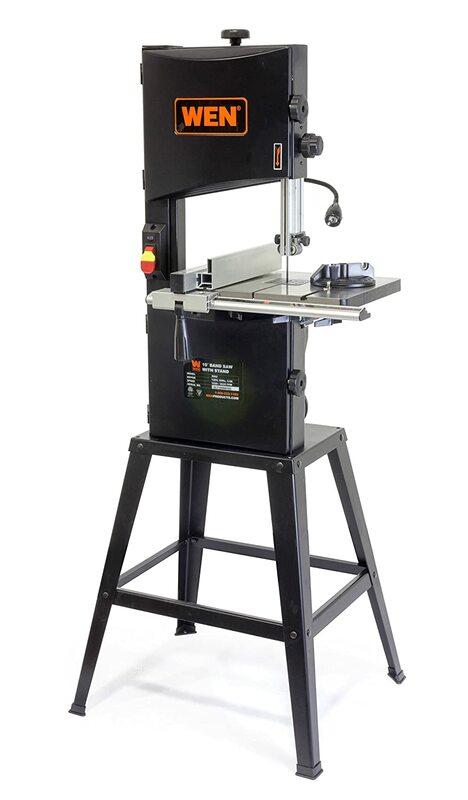 Incorporating a wide range of high-quality features, this product is designed to handle small to medium-sized cutting applications in your workshop. 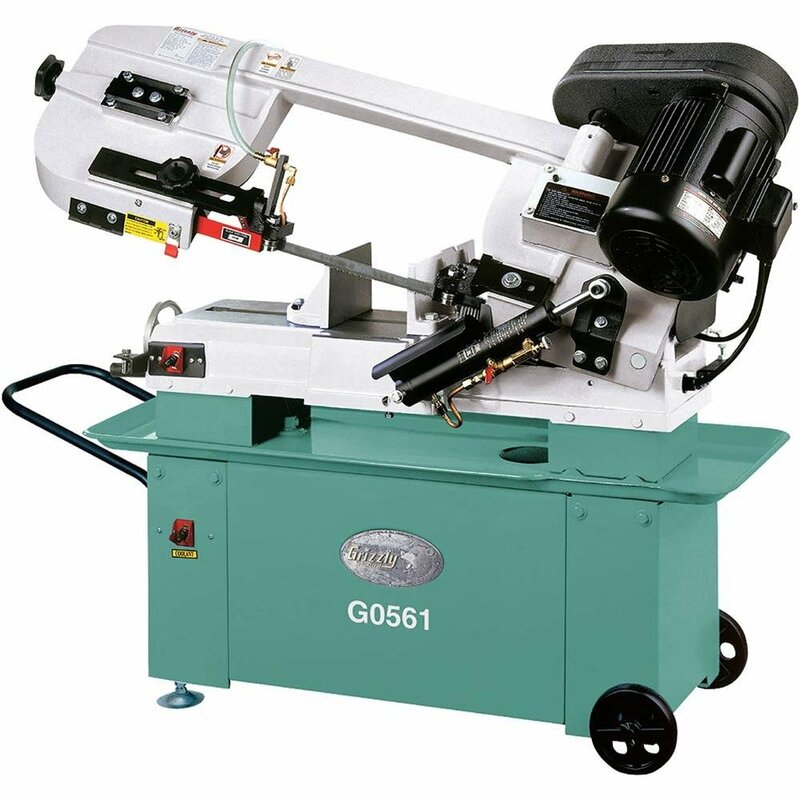 The Grizzly G0555LX is one of the best band saws 2019 which you can purchase within this price range. Available at a pretty affordable price, this is basically a two speed saw as you can adjust its speed from 1800-3100 FPM. The blade capacity of this product ranges from 1/8-inches to ¾-inches and the blade length is 93.5-inches. The cutting capacity of this 14’’ band saw is 13.5 inches and it also comes with a 6-inches resaw capacity. As compared to the previous band saws from Grizzly, which comes incorporated with aluminum wheels, the Grizzly G0555LX is designed with superior cast iron wheels. The wheels come fitted with rubber wheels and for ensuring smooth operation, the manufacturer has especially computer balanced these wheels. It means that you don’t have to deal with unwanted vibrations while using the Grizzly G0555LX band saw. The Grizzly G0555LX comes with a heavy-duty cast iron table which provides a suitable fusion of smoothness and long-term durability. This table is designed at a height of 43-inches from the surface which makes it viable for a wide range of woodworkers. You can tilt this table up to 45 degrees on its right side and 10 degrees on its left. Also included in this purchase is a miter gauge along with an aluminum fence. A separate handle is provided at the front side of this saw which comes handy for adjusting the fence’s position. When the fence isn’t needed, you can also remove it from the table without any hindrance. While choosing the best band saw, it is imperative that you should look for a superior dust collection mechanism. As this tool is going to handle a number of different materials in your workshop, it tends to produce a decent amount of dirt as well as debris. In order to ensure a clean workplace, the Grizzly G0555LX comes with a 4-inch dust port. As compared to any other cheap band saw, which normally relies on a 2-inch port, this one allows better dust expulsion thanks to a bigger dust port. 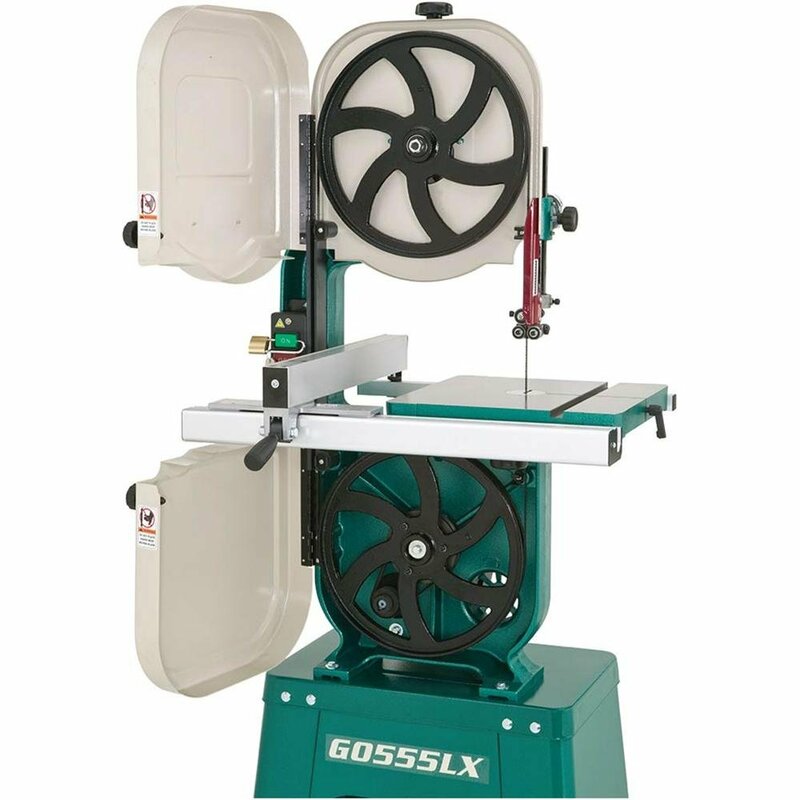 The Grizzly G0555LX is ideal for all those woodworkers who’re looking to purchase a professional grade band saw at a pretty affordable price. Weighing in at 247lbs, this is one of the lightest cutting tools in the market. It also comes with a decent price tag and when you can operate this saw at two different speeds, it makes it quite a versatile cutting tool. While choosing the best portable band saw, one should look for a number of different things in this purchase. Portability, for instance, is the first thing which plays an important role in this acquisition. But apart from it, what are the other important features which you should keep in mind? 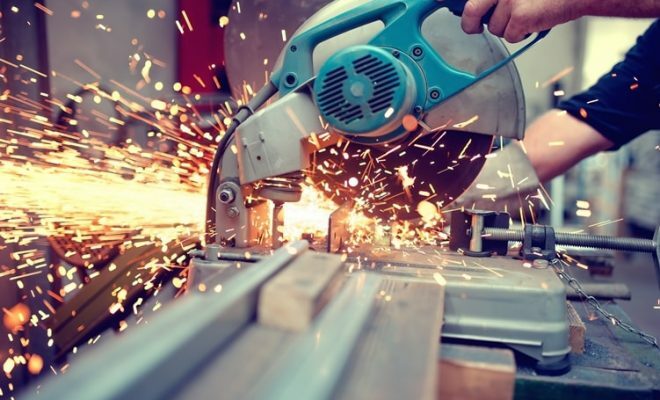 In order to answer this question, we’ve prepared this comparison table in which the best portable band saws go head to head with each other in terms of a number of different features. When it comes to Dewalt, it is one of the most famous brands in the field of power tools. Having produced a series of high-quality cutting tools in the past, their products are equally appreciated by professional as well as occasional DIY users. 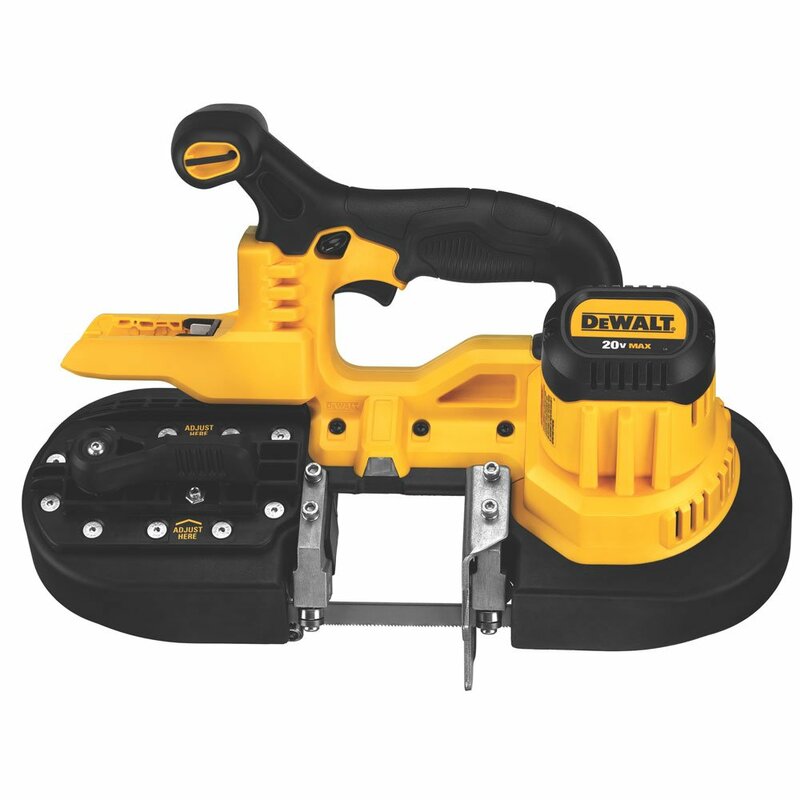 The DEWALT DCS371B is another superb quality product from this manufacturer which is designed for all those electricians, plumbers and other such woodworkers who’re looking to purchase a portable band saw. Backed by a powerful battery, this is basically a cordless cutting tool which means that you don’t have to worry about the cord while operating this power tool. The DEWALT DCS371B runs on a powerful 20-volt Lithium-Ion battery. 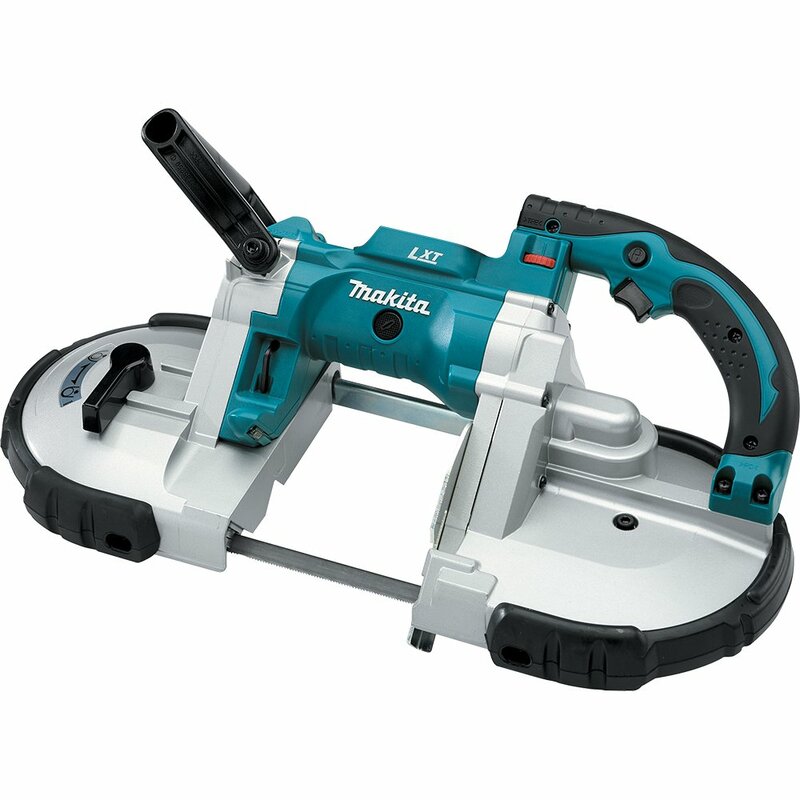 As compared to other cordless band saws, this one comes with a much better output. Another thing which is quite impressive about this product is that it comes with a long battery life. This machine won’t stall on you in the middle of your job as the 20-volt battery incorporates a decent charge. However, one thing which you should keep in mind is that the DEWALT DCS371B comes as a bare-tool. It means that you won’t get the battery or even the charger with this purchase so you have to purchase both these accessories on your own. For optimal comfort, the DEWALT DCS371B comes with an ergonomic handle. This handle incorporates a soft grip which ensures that regardless of your work duration, you won’t get tired while using this band saw. Furthermore, the overall weight of this saw is just above 10lbs which makes it easy to carry, even for the newbies. The DEWALT DCS371B also comes with an attached LED light. It comes handy for illuminating your workplace which is ideal for all those of you who want to work anytime, any day. 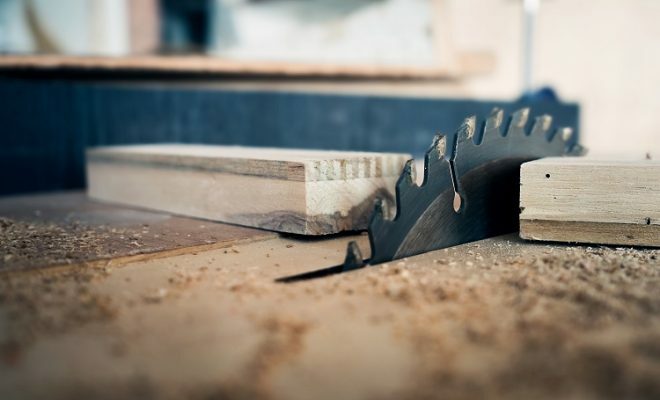 If you’ve used a band saw in the past, you might be aware of the expensive nature of the band saw blades. It isn’t easy for everyone, even for the professional customers, to replace the blades on a consistent basis. In order to make sure that no such problem exists with the DEWALT DCS371B, it features a superior blade tracking mechanism. This particular feature extends the lifespan of its blade which means that you can use a single blade for an extended duration. If you’re looking for a portable band saw, one which also comes with a pretty affordable price, the DEWALT DCS371B is worth a try. Incorporating a lightweight design, this product runs on a 20V lithium-ion battery. It is very easy to operate this saw, thanks to the ergonomic handle, and when it also comes with a tool-less blade change mechanism, it makes it a worth-making investment. The Makita XBP02Z is a highly versatile band saw which can be used on a wide range of cutting projects. Incorporating an 18-volt Lithium-Ion battery, this product is designed to cut through a wide range of metal materials. You can also use this metal cutting band saw for various other projects, including plumbing and electrical, and the fact that it also comes with a variable speed control makes it one of the best band saws in its category. As already mentioned, the Makita XBP02Z comes with a 6-setting variable speed control. With the help of the speed dial, which is designed at the front side of this unit, you can adjust this band saw’s speed from 275 to 530 FPM. Such kind of design gives you the luxury of working with optimal blade speed for every single cutting application. You might be thinking that a portable band saw isn’t good enough for heavy-duty cutting applications. Right? Wrong. The Makita XBP02Z comes with a 4 ¾ -inches cut capacity and you can use this band saw to cut a number of different materials including conduit, pipes, metal sheets and even Unistrut to name a few. This is made possible by its ultra-sharp blade which not only ensures clean cuts but at the same time, it also comes with a long-lasting durability. It is designed to withstand the harshness on your job site as you can use it for a consistent duration of time. For enhancing the lifespan of this unit, the Makita XBP02Z incorporates a protective bumper. This bumper is made of rubber and it protects this model from the regular wear and tear. This band saw also features a removable hook and when the overall weight of this unit is just above 14lbs, it makes it a fairly lightweight power tool to work with for a good few hours every day. Having said that, the Makita XBP02Z, just like the aforementioned model, comes as a bare-tool. The battery and the charger need to be purchased separately so keep this thing in mind while making this acquisition. The Makita XBP02Z is specially designed for the professional contractors who’re looking to purchase a heavy-duty, cordless band saw. Starting from using this product in various electrical applications, you can use it in plumbing, metal building or even metal fabrication along with various other projects. 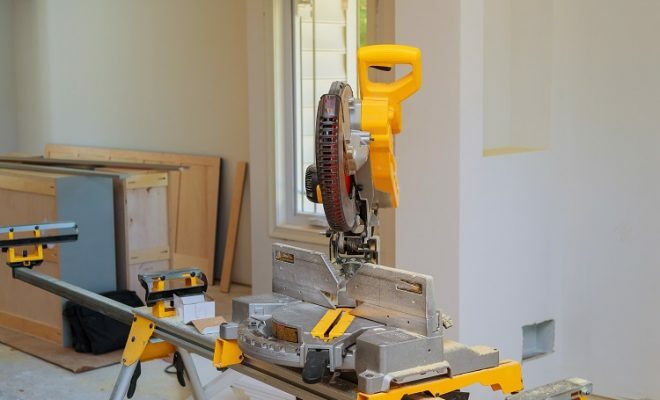 One of the least expensive products in this list, the Milwaukee 2429-21XC is ideal for all those of you who’re looking to make a budget-oriented purchase. Available at a pretty affordable price, this band saw still comes with a complete package. It means that on making this purchase, you’ll get everything, including a battery and the charger, which is required for work with this saw. Furthermore, the compact dimensions of this band saw make it viable for a single-handed operation. 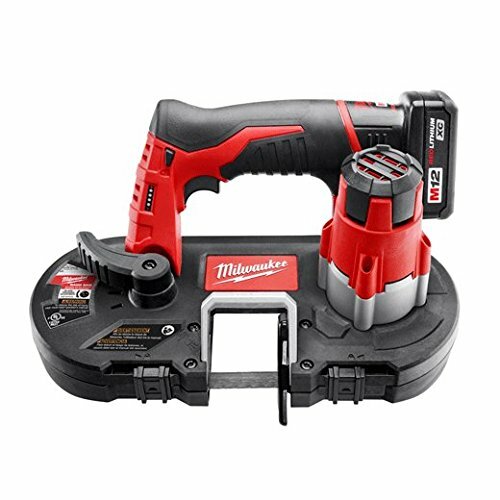 The Milwaukee 2429-21XC comes with a 12-volt REDLITHIUM battery which allows the bands saw to run at 280 SFPM. At this speed, it can cut a 0.75-inch EMT in as low as just 3 seconds. You can charge this battery in 30-minutes and on a single charge, it is designed to make no less than 150 cuts on a ¾’’ EMT. However, if you intend to use it on heavier materials, it will make lesser cuts. When it comes to ensuring your personal safety, this is where the Milwaukee 2429-21XC stands tall against the competition. This is one of the very few band saws in today’s market which meets OSHA requirements for a single-handed operation. It also comes with a lower guard which protect the blade when it goes outside of its active area. Another exciting feature in the Milwaukee 2429-21XC is that it comes with a built-in LED light. Unlike other band saw reviews, in which you need to turn on the light manually, this light starts working once you press the trigger. If you’re tight on your budget, but still want to purchase a high-quality cutting tool, the Milwaukee 2429-21XC is one of the best cheap band saws which you can purchase from today’s market. This product comes with everything which can be needed on the job site so you don’t have to purchase anything after making this acquisition. While working with a band saw, it is imperative that you should keep your fingers away from the line of cut. Always wear safety goggles while working with this saw as it will protect your eyesight from a loose piece of material. Similarly, if your band saw tends to produce a great degree of noise, you can also use earplugs for your own safety. I was looking for some information regarding this and finally got one. Thanks for sharing the information with us. The article was a great help to me.